A long-overdue shift in America’s China policy is underway. After decades of ‘constructive engagement’—an approach that has facilitated China’s rise, even as the country has violated international rules and norms—the United States is now seeking active and concrete counter-measures. But is it too late to rein in a country that has emerged, with US help, as America’s main geopolitical rival? From Richard Nixon to Barack Obama, successive US presidents regarded aiding China’s economic rise as a matter of national interest; indeed, Jimmy Carter once issued a presidential memo declaring as much. Even as China defied world trade rules, forced companies to share their intellectual property and flexed its military muscles, the US held onto the naive hope that, as China became increasingly prosperous, it would naturally pursue economic and even political liberalisation. America’s ‘China fantasy ’, as James Mann calls it, was exemplified by Bill Clinton’s argument in favour of allowing China’s admission to the World Trade Organization. Citing Woodrow Wilson’s vision of ‘free markets, free elections, and free peoples’, Clinton declared that China’s WTO entry would herald ‘a future of greater openness and freedom for the people of China’. That is not what happened. Instead, China established itself at the centre of global manufacturing value chains, as countless companies moved their production to the country—including from the US—while keeping its markets, politics and people under tight control. In fact, China’s dictatorship has become even more entrenched in recent years, as the Communist Party of China has used digital technologies to build a surveillance state . Meanwhile, the US has run up trillions of dollars in bilateral trade deficits. Nonetheless, America’s China fantasy endured, leading Obama to look on as the country created and militarised artificial islands in the South China Sea. At the height of the Chinese government’s island-building, Obama argued  that ‘we have more to fear from a weakened, threatened China than a successful, rising China’. As a result, China seized de facto control  of a highly strategic sea corridor through which one-third of global maritime trade passes—all without incurring any international costs. 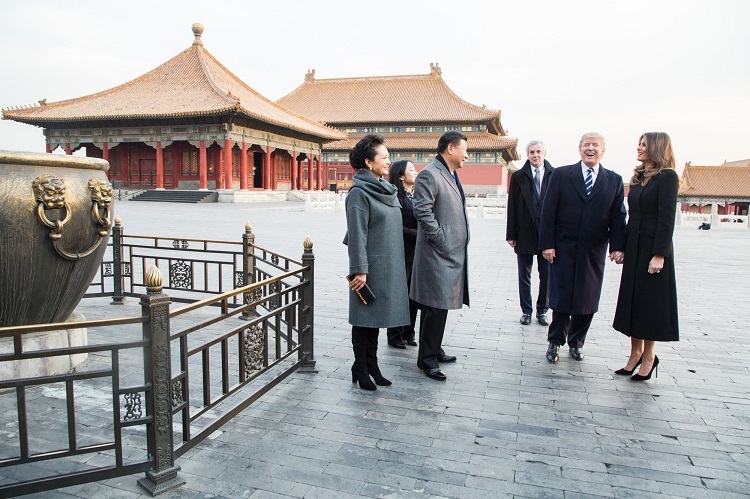 Over the last couple of years, however, the China-policy debate in the US has begun to reflect more realism, with a growing number of voices recognising China’s ambition to supplant its American benefactor as the leading global superpower. The US finally called China what it is: a ‘revisionist power ’ and ‘strategic competitor ’. And, just this month, Vice President Mike Pence bluntly accused  China of ‘using political, economic, and military tools, as well as propaganda, to advance its influence and benefit its interests’ in the US. Whereas Trump has used tariffs against allies as leverage to secure concessions and clinch new trade deals, US tariffs targeting China—which could endure for years—are intended to bring about more fundamental and far-reaching change. Even the revised deals with US allies are intended partly to isolate China, thereby forcing it to abandon its mercantilist trade practices, such as forced technology transfer. To be sure, this does not mean that the US is going to adopt an overtly confrontational China policy. Nor does it necessarily mean that, as many speculate , a new cold war is in the offing. For example, China still gets a free pass on human rights abuses, from holding up to a million Muslims from Xinjiang province in internment camps  to effectively kidnapping Interpol President Meng Hongwei. And, despite his assertions that the Obama administration’s response to China’s activities in the South China Sea was ‘impotent’, Trump has done little to counter Chinese expansionism. Instead, the US seems to hope that it can use primarily economic levers to weaken China—a kind of death from a thousand cuts. But will it be enough? Or is the US effectively shutting the stable door after the horse has bolted? Thanks to its great strides in strengthening its technological prowess and geopolitical clout, China is in a strong position to withstand US pressure to change its ways. It will have to sacrifice some economic growth. But for President Xi Jinping, such a sacrifice would be worth it, if it meant protecting not only his own position, but also his ‘Chinese dream ’ of global preeminence. Even if US pressure escalates significantly, China will likely adopt a ‘two steps forward, one step back’ strategy to keep progressing towards its ambitious goals. Brahma Chellaney, professor of strategic studies at the New Delhi–based Center for Policy Research and fellow at the Robert Bosch Academy in Berlin, is the author of nine books, including Asian juggernaut, Water: Asia’s new battleground and Water, peace, and war: confronting the global water crisis. This article is presented in partnership with Project Syndicate © 2018. Image courtesy of the White House.